Invested in your new modern flat screen TV? Want it to look like an expensive painting on the wall and properly secured at the same time? It is hard to keep up with new technologies – we have been bombarded by the latest hi-tech novelties from major TV manufacturers. We expect our TVs to have quality HD picture with the highest resolution, access to the Internet and a bunch of other cool features. We also want it to look the part by adding a futuristic appearance to our home. Sloping TV, messy cables and a ruined wall are certainly not part of the look you’ve imagined! Unfortunately, this can happen if the job is not done by an expert. TV wall mounting can be challenging, especially if you don’t have the right tools and skills for the installation. You have be able to locate studs and power cables behind the wall, make sure you use proper skews for the mount. Or you let Sydney Antennas Technicians do all the hard work for you. 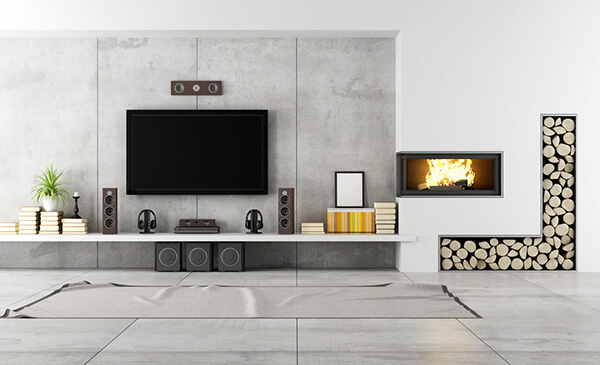 And you can relax knowing your precious piece of equipment and your home walls are in capable hands.Our professionally trained installers have many years’ experience in TV wall mount installations. We use only quality universal type brackets suitable for particular size of TVs. Alternatively, we can install your own bracket (providing it matches your TV specifications and is made of a quality material). If you decide to buy a TV bracket make sure you get it from a specialised retailer like Harvey Norman, The Good Guys, Bing Lee. No matter which option you choose our technicians will give the job a spotless finish. They will make sure all the cables are hidden, your current devices are correctly connected and there is no mess left behind.